A woman who suffers from a rare psychological disorder that caused her to pull out every single hair on her head is set to undergo a £10,000 transplant. 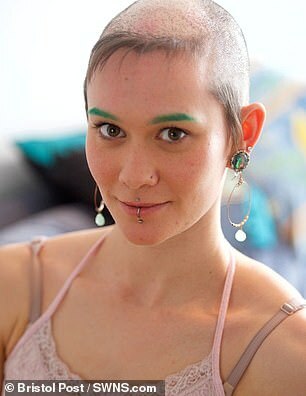 Claire Jenna Ory, 24, developed trichotillomania at just ten years old when the stress of starting a new school left her with a bald patch from pulling her hair out. Cruel bullies would try to pull Miss Ory’s wig off and nicknamed her ‘alien’. Unable to take much more, she attempted suicide twice at 13. Although now in better place, Miss Ory – who works as a circus contortionist – still suffers from the ‘addiction’, which she compares to the need to smoke cigarettes. Now bald, Miss Ory’s father Philippe has offered to pay for the transplant. Speaking of her disorder, Miss Ory, who lives in Bristol, said: ‘The condition is like an addiction. It’s like smoking cigarettes.